Paseo Racquet Center hosted a High School Coaches Workshop on Friday, January 26th from 10am- 2pm for 20 area tennis coaches. Greg Prudehomme, Head Pro at Paseo, conducted the workshop which included information on how to structure a team practice; teaching stroke techniques and mechanics; drills for singles and doubles; and, coaching during matches. All of the coaches received a booklet with complete descriptions and diagrams of all of the drills and topics. 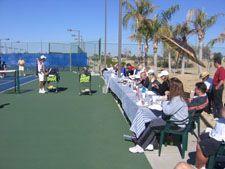 Both on-court and off-court sessions were held and coaches received alot of great drills and information to get them ready for the High School tennis season.